Innovations in computer science and technology are proceeding at a breakneck pace in areas from Internet commerce to handheld devices to robotics. Encyclopedia of Computer Science and Technology, Third Edition presents accurate and comprehensive information available about this vital area that is accessible both to the professional and layperson. 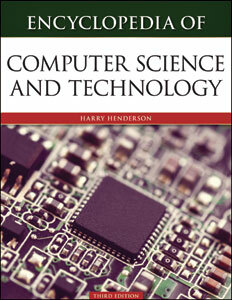 Covering much more than basic computer commands and procedures, Encyclopedia of Computer Science and Technology, Third Edition summarizes how technology has developed, the future of computer programs and applications, and the significance of computer components, featuring hundred of entries that detail distinct contributions in computer development, hardware, operating systems, and networking. Major corporations and organizations in the field are also covered. Harry Henderson is an educational and technical editor and writer specializing in the areas of mathematics and computer science. He is also the author of many other Facts On File and Chelsea House titles, including Modern Robotics; Modern Mathematicians; Artificial Intelligence; and Nuclear Physics.